The Politico has come up with a non-story about the film September Dawn, which details the mass killing of 120 settlers by fanatical Mormons in 1857, somehow being released at a strategic time to harm the presidential candidacy of Republican Mitt Romney. Of course such an idea is ludicrous, because to lend this story any credibility means to assume that Romney actually has a chance. Secondly, I'm tired off all the hooplah about Romney being a Mormon. Whoop-de-doo. Who cares what religion a candidate practices? It's their own private business and should have nothing to do their ability to hold public office. It really shouldn't be a factor. This is just another paranoid right-wing freak out thinking big bad Hollywood has issued a hit job on one of their "key" players (seriously, how many people actually know who Romney is? ), when it really has nothing to do with them. They're always seeing people out to get them. This is no better than Iran thinking that 300 is anti-Iranian American war propaganda. It's just silly. 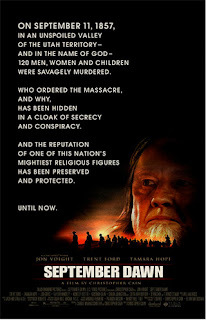 It's a movie about a shameful piece of Mormon history. 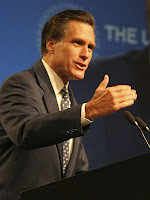 Mitt Romney just happens to be a Mormon. You have to be really stretching to find any insidious intent there. Seriously. Let it go. There are far more important things going on in the world right now.